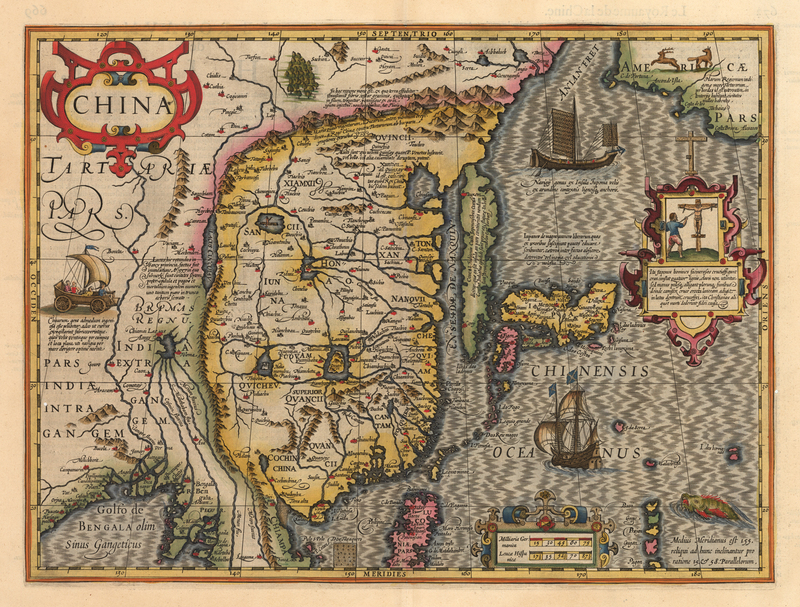 This is a finely colored example of one of the most sought after maps of China of its day. This magnificent early 17th century map by Jodocus Hondius is one of the first European produced maps of the region to be published. Of the lands in the Far East, China was seen as the wealthiest and most mysterious and the Jesuit missionaries were among the first to make the dangerous journey. Geographically speaking, the map is an interesting combination of fact and fiction, containing only rudimentary geographical information, as in the west little was actually known of the region at the time. Some prominent features include the peninsula of Korea, the Great Wall of China, and a note showing the location of the palace of the emperor of China. Inland is pictured a wheeled conveyance with sails such as those described by Marco Polo as being common in the Orient. Various provinces are delineated, and a number of great cities are noted. Several large lakes dominate the interior of China, and the mythical Chiamai Lacus is shown as the headwaters of five major rivers in India. A corner of NW America includes a note regarding the Tartar hordes who inhabit it. Japanese islands are depicted off the mainland of China, with a vignette of the persecution of a Christian missionary included. A Japanese seagoing vessel is depicted. The ocean is rendered in a pattern suggestive of waves on its surface and a sea monster embellishes the lower right quadrant. Jodocus Hondius (1563-1612) was the founder of the famous 17th century Dutch map publishing family. Hondius, along with sons Jodocus II and Henricus and son-in-law Jan Janssonius, was prominent in Dutch cartography and competed with the emerging Blaeu family map business. When Hondius acquired the copperplates of Gerard Mercator’s atlas, he prepared this map for inclusion in his Atlas Sive Cosmographicae…, first published in 1606. Condition: This map is in B+ condition with the only issue being two small worm holes, one of which just enters the image in the lower left quadrant.